LG currently operates an overnight shift 7 days a week dedicated to hybrid taxi cabs. With this experience we can describe Gen 2 Prius transmission failure as routine, somewhere between 150-250k miles. The most common indication is trouble code P0AA6 (no other symptoms), but we have also seen broken chains, failed bearings, bad MG1s (trouble code P0A7A and P0A92), and seized planetaries altogether. We have also seen these problems on private cars, as they get older. Our original poster child (see the 250k mile Prius blog) is now outpaced by many a commuter and second owner, and our experience is far more informed. Not only have we seen failures, in the process we’ve developed industry-leading procedures for testing insulation, impedance, and mechanical problems. We are ahead of the dealer. Upshot: if your car has a problem we can isolate the source (be it transmission OR somewhere else). Not only can LG navigate the jungle of diagnosis to provide a GUARANTEED repair, we can repair the car at a fraction of dealer cost with second hand units and honest labor charges. 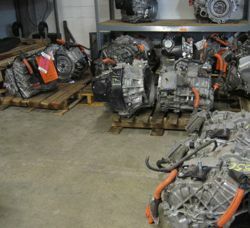 Over the years we have replaced dozens of Gen 2 Prius transmissions to the point that we keep several used units in stock (pic of our “large parts” inventory). We also stock inverters, batteries, simple sensors, and ECUs. We are capable and prepared to fix your car. For more on individual problems, keep reading. To skip to prices, CLICK HERE. The generic information code is 526, and the transmission specific info code is 613. While there are other potential causes of P0AA6, the most common by far is winding deterioration in the traction motor (MG2). The Gen 1 equivalent of P0AA6 is P3009, and when it sets the car will continue to ready on and drive normally. With Gen 2 Prius, the car will not allow the car to restart once the code sets. Toyota engineers decided HV faults were highly dangerous and the car was unsafe to drive. On the Gen 3 Prius, the trouble code is the same (P0AA6) but the car will still ready and drive. Thus we can interpret that Toyota admits this condition is not that unsafe after all. Taxi drivers are tenacious as hell, and those commissioned to Gen 2 Prius often resort to disconnecting the 12v battery (or pulling the necessary fuses) to erase the P0AA6 and continue driving. I’ve seen them drive for months without repair (one went so far as to install a quick disconnect handle for the 12v in the trunk). Eventually the car developed another problem (more on this later) which necessitated a transmission replacement. Needless to say, except for the prohibition of “ready” mode, the car will drive normally. For dealer techs unfamiliar with it, the problem is mysterious; most recently a customer came to us for diagnosis after the dealer already installed an inverter (at no small charge) despite the information code 613 (pointing to the transmission). Unless the winding is seriously deteriorated, it is rare that P0AA6 will set when the transmission is cold; only after driving several miles under load (taxi/highway) will the insulation in the windings lower enough to set the code. This is a case where the technician cannot confirm that the problem is inside the transmission (at least without getting the assembly suitably hot before performing an insulation test). The car’s diagnostics (which will automatically test each HV branch to help isolate the source of the leak) aid in this regard. For instance, the information code 612 points to the HV battery (rather than the transmission) which can direct the technician to look for damaged battery modules, leaking electrolyte to the chassis (ground). Other transmission issues not covered under warranty are below. We’ve also seen a support bearing in the final drive fail; symptoms are rattling when moving or banging when slowing or starting. The cause is excessive movement in the final drive with the gear out of place. Eventually the stress will crack the case, causing a transmission fluid leak, a broken chain, or a seized gear. 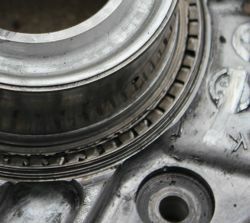 Winding deterioration is also possible in MG1, the smaller motor/generator inside the Toyota HSD transmission. Symptoms may be similar to the noises of a bad bearing or broken chain, because MG1 is engaged when the car attempts to crank the engine. Sometimes the gearset makes noise (the motor’s shorted windings will shudder, and the gearset will clatter accordingly), but sometimes the motor is bad enough that the inverter will simply default when attempting to engage it, much like a bad starter making a single “click”. When attempting to “ready”, the click is heard and then the warning lights appear, and the car is incapable of starting the engine. The vehicle will still move under the power of MG2 (the traction motor) but the HV battery will eventually deplete to the point that it will ready off and it will no longer attempt to restart (“ready”) at all. Both of the trouble codes relate to the inverter, which is why it is so often condemned as the source of the problem. The inverter provides power to the motors, and with a short the inverter current will peak, setting a code. This is exactly the same scenario as P3125, info code 287 with Gen 1 Prius. Sadly I expect many an inverter will be thrown at Gen 2 Prius, despite the experience with earlier models. This is entirely a case of “killing the messenger”. What of repairing these problems, rather than replacing the whole unit? It’s a good question. At this point there is no source for MG1 or MG2 windings, bearings, or gears outside of the total unit. We do occasionally get salvage units that are half good (cracked on one end, for instance) that can be used for parts. But by in large the effort to rebuild a unit is as much labor/parts as the total assembly ($800 used), with the additional liability of one of the aforementioned problems developing. As our cache of good used parts grows, we may find this a better option, especially as the demand for used units goes up. At this point our approach is to gather as many good low mileage units as we can afford. 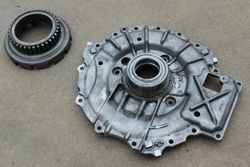 As of this blog we are able to find used Gen 2 Prius transmissions with low mileage at a reasonable price ($800). After dozens of jobs, only recently did we encounter a used unit with the faintest beginning of a needle bearing noise, which we replaced a second time on the house, as part of the original job. In short, while we are confident in the reliability of used units, we are very careful to install ones without issue and extend a one year, 12,000 mile warranty against transmission problems. ← Prius Battery Rebuild: Yes or No? 2007 prius Trans starting to slip when trying to pass on a hill temp out side 102 degrees F. If I drive to your garage how long to fix . Would better oil help. Do you have estimate of cost used. Sorry I missed this original post. Sounds like reduced electric assist, which can be normal. If the engine has lost compression (from history of oil burning) it may be lowered engine assist. Again no need to drive all the way to SF, Atomic Auto in Portland OR is closer and capable. Since my 2007 prius is just now slipping do you think it will make it to your garage from Kennewick Wa. Not sure what you mean by slipping. I’d suggest Atomic Auto in Portland.